The Walkie Chest Pack from Authentic Crew Gear. The ACG Walkie Chest Pack is conviently small measuring 9" (23 cm) by 8" (20 cm) but has plenty of room to carry a walkie talkie as well as several accessories and other supplies. 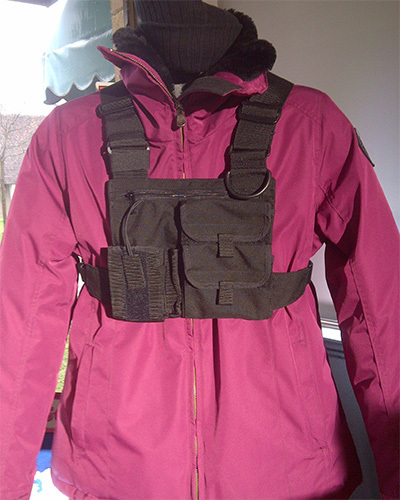 All of the straps are easily adjustable allowing for one size to fit all. 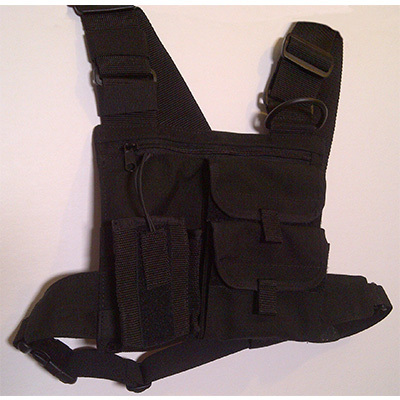 The pack contains a walkie holder (the same design as our stand alone Walkie/Cell Pouch), two velcro-flapped pockets, one large zippered pocket (measures the entire size of the chest pack), a handy D-ring for clipping-on necessities, as well as a convenient pen holder right in the front for quick and easy access.